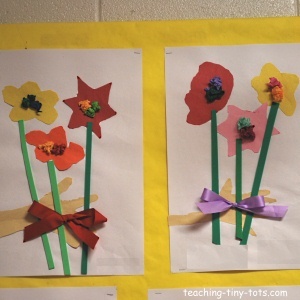 This flower art project is a great classroom activity. The child's hand adds a special personal touch and then it is embellished with tissue and ribbon. Cute flower art project for kids. Perfect for classroom too! Trace hand on construction paper. Trace flowers on construction paper. Cut thin green strips for stems. Have children cut out three flowers. Have them arrange on the paper or lay around the paper and instruct what order to glue down. Crumple tissue into balls and glue down. Glue on bow. This may need craft glue for more secure bond. This is a great activity to help develop fine motor skills. Keep simple flower shapes especially for younger children. For very young children, you could use die cut flowers or trace and cut three of the same flowers. This is a great activity for Spring or a unit on plants. Reading books on plants and parts of plants will also help children understand where to place the flower and stems. Add a poem or message and this can make a cute Mother's Day picture for children to make and take home. We like using Aleene's Quick Dry Tacky Glue for gluing on wiggly eyes, ribbons and other small items. You can find it at Michael's and other stores that have a craft section.